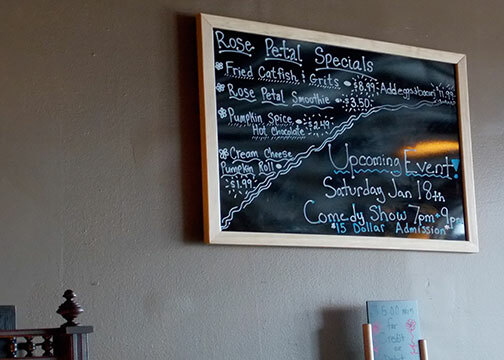 Carolan and I stepped into Rose Petal Cafe & Lounge, located at 322 West Chelten Avenue in Germantown. About ten people sat throughout the little cafe, enjoying a late brunch. A waitress carries steaming mugs to a table, whipped cream melting around the top. She immediately welcomes us, and we sit at the bar and order mugs of coffee. In one corner of the restaurant, a television and lounge chairs offer a cozy section to relax and stay a while. On another side of the room, there are long tables and small round tables that offer either a casual lunch or a more intimate dinner date for customers. 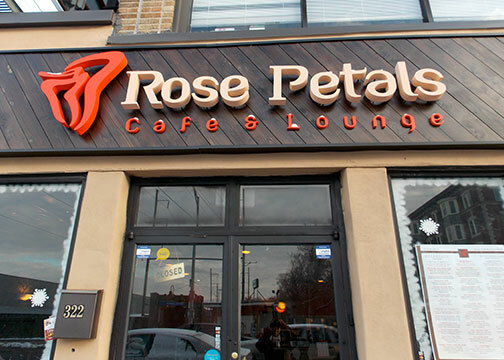 Rose Petal Cafe & Lounge offers a more elegant style of food compared to the other places we saw along Chelten Ave. Desmin Daniel, owner and head chef, came out from where he was preparing food to introduce himself to us. The cafe has been open for 6 months; Desmin and his wife, Jania, who sat at the counter beside me, opened the restaurant to honor the memory of their loved ones who had passed away. After the passing of Desmin’s sister and grandmother, they realized it was time to fulfill their dreams in the restaurant business. 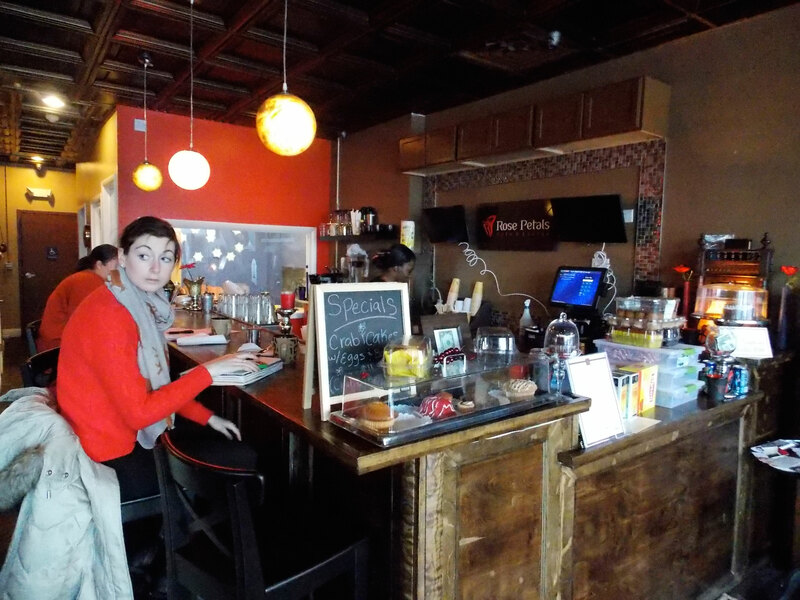 A friendly, laid-back atmosphere, Desmin explained that they specialize and take pride in the numerous styles of waffles they serve. 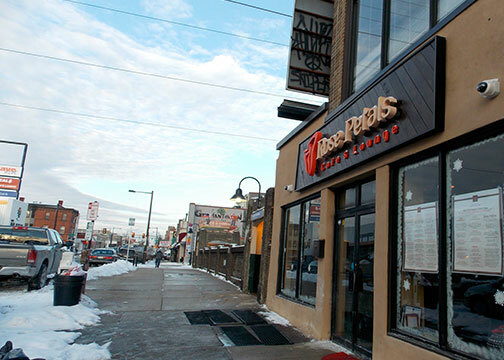 They also serve deli sandwiches, have a smoothie bar, and on Friday and Saturday evenings it becomes a lounge, where people can enjoy live entertainment and a special Latin/soul fusion dinner menu celebrating a blend of Puerto Rican and African-American cultures. 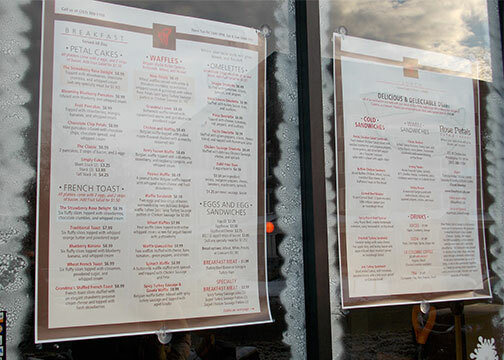 Since the restaurant is still in it’s prime time, the menu continues to expand over time, and the Daniels are excited about future plans for their business. If you are looking for an intimate affair for the Valentine’s Day weekend, there will be a special on February 14th and 15th to celebrate love and friendship. The evening includes an appetizer, choice of dinner, dessert, and complimentary wine for $29.99/per person. If not Valentine’s Day, Rose Petal Cafe & Lounge is a perfect place to spend an afternoon, reading a book and indulging in some gourmet food. Stop in, you won’t regret it.